Dion was a Freemason for quite a few years, working his way up to become Master Mason of lodge 844, which is quite an achievement. After lodge 844, Dion moved on to Rotary, but remained a member of the Research Lodge for the rest of his life as well as an active Rotarian. Fellow Rotarian, friend and hardresser for over 30 years: Errol Sharp delivered the following at the memorial service. 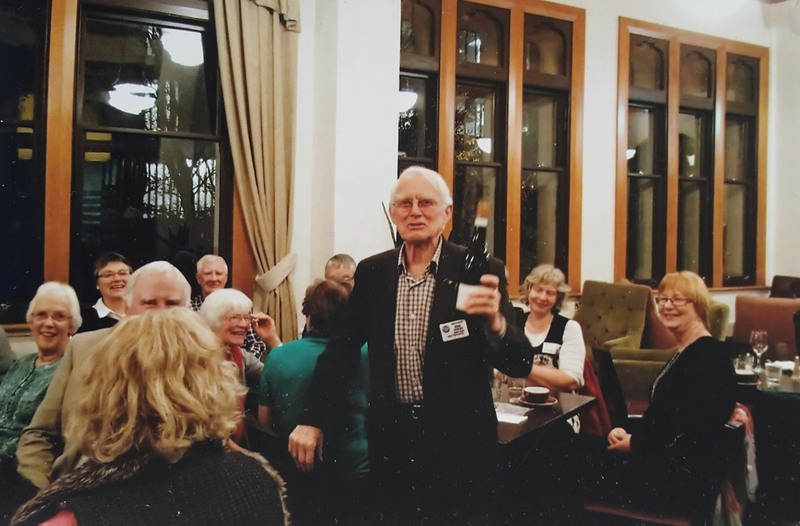 I have been asked by the family to relate a little of Dion’s involvement with the Rotary club of Dunedin North since joining in 1977. The role of Rotary, like many service clubs of their time, was a vehicle for aiding communities as a group where individual efforts would be difficult. A formally male-only group, Rotary was perceived to be male, pale and stale. Dion was certainly male, but never stale. The altruistic aims of the club were divided into areas of service to community, chaired by a person charged to actually achieve something. Within a year of joining, Dion chaired a group focussed on overseas aid. Medical supplies to Tonga, gas cookers to the New Hebrides, school books to the islands. This was to be a personal project he continued to maintain on an individual basis for many years. These were to be some of the influences that established Dion’s impact on our group in helping communities, locally and internationally, for the following thirty-eight years. Until recently the committees would meet monthly at what were euphemistically known as fireside meetings. Social gatherings but with the purpose of creating or supporting assistance. It was always special to meet at Noelene and Dion’s home and a walk through the gardens was truly inspirational for one who only had a modest section to maintain. The annual trailer raffle raising funds for the hospice by the club has required considerable effort in planning the enterprise and manning the sales. For the last fifteen years the project has achieved almost half a million dollars for mainly the operational purposes of the Hospice. The organisation for this endeavour has been an immense task for one small group. Dion’s interest, indeed passion for the work of the hospice as we have heard, was evident by dedication to actually manning the sales tables since the project’s inception until this last December. David Goodchild was telling me it was as recently as just before Christmas he put in an emergency call to Dion. Someone had failed to turn up. He was there within the hour. Russell tells of the time Dion turned up for a shift looking uncharacteristically somewhat dishevelled. A mishap on his windsurfer had left him with bruising and cuts to his head, still trying to staunch the bleeding when he arrived. Until recently, he was involved in a rotary project planting a section along the cycleway by Sawyers Bay, walking to and from the site. He only stopped when recently, after a discussion with Noelene, he agreed that actually walking back was going to be somewhat problematical. For years and until recently, he carried on work started by Rotary tidying gardens at Women’s Refuge. This led to planning, planting and maintaining vegetable gardens at their counselling centre. Late last year Dion brought the night shelter’s work to the club’s attention. An address by a representative of the shelter’s work and their needs led to financial assistance given. In 1999, he was awarded a ‘Paul Harris fellowship’ usually given to people in the community. The highest award in Rotary international. In 2007, he was given a sapphire, an additional rare honour. This is a brief overview of the activities Dion immersed himself in his club. Noelene has asked me to read to you a portion of a letter written to friends in 2007. Last week Dion was profiled on a page of the ‘Star’, featuring voluntary services for his work with cancer patients as a driver, visitor, grief person for spouses, and also for his work collecting books from schools, storing, sorting, arranging for them to be transported to Pacific Islands which is a service he does, as a Rotarian, but single-handed. Then last Monday when we braved the elements, snow followed by frost, to go to the Rotary presidents changeover night, when annual awards are sometimes given out, he was presented with a Paul Harris Saphire Award, in recognition of these same services. He was given a Paul Harris Award about 8 years ago and the Saphire is like a second one. To get this is fairly rare. He was so surprised he was nearly in tears to receive it and I was very proud of him. His age of 81 was mentioned in the newspaper, and no-one could believe it. His gardening and windsurfing were also mentioned in both the newspaper and the citation for the award. He went windusrfing twice in May on nice days at the beginning of winter so he deserves a medal for that! This morning he is at his Tai Chi class with lots of ladies down in Sawyers Bay. I think it is the social highlight of his week. With the cold weather we’ve been having, he has ben busy working on his genealogy files as well. What a man! He trimmed his 30-40 foot hedge again in April/May/June, after we had told him to. He says he won’t do it again! He expects to do some more chainsawing next week when he has a woofer here to help him trim branches and carry them away. Dion will be the one up the tree! Meanwhile he keeps up the firewood supplies for burning in our open fire which is lovely on cold evenings. Our thoughts are with the Ombler family – for Rotary, a lost friend.